With a little time off on the horizon, someone on the McDonald's social media team may have made a little mistake. It was one of those little details that can easily get lost in the shuffle while you check traffic to Aunt Patti's house. 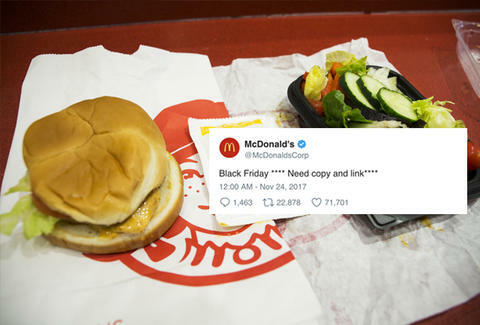 For Black Friday, McDonald's tweeted out "Black Friday **** Need copy and link****." The Wendy's Twitter snark machine was quick to sense an opportunity, as it has previously when it was blocked by Hardee's or went after McDonald's for the whole Szechuan Sauce fiasco. The chain went low and took a shot at the Arches' oft-broken ice cream machines. Despite offering free Frostys for a year to raise money for charity, Wendy's overriding tone is mean. Like McDonald's own tweet, the Wendy's jab struck a chord, getting retweeted more than 280,000 times. (McDonald's is just over 22,000.) Wendy's was so proud it gave itself a little back pat while referencing the #NuggsForCarter campaign. We're gonna end up owing ourselves a year of free chicken nuggets at this rate. Wendy's even spent a little time on an off-day mirthfully adding secondary burns in the replies. Three dogs in a trench coat pretending to be human. This is basically like winning a Twitter Oscar. Point made. Even holidays won't deter the team behind Wendy's merciless Twitter account.